The target date, time and time zone to carry out the plan. The target segment to be used (contacts). The consumer.The platform, external to Contactplan, which is to receive the list of contacts. Whether it is a single-shot or a recurring plan. The Do Not Disturb (DND) policy.Used to manage the volume of messages sent to contacts. The number of contacts that should be included in the contact list. What action to take if the required number of contacts is not available in the appropriate segment. Plans can be saved as a Draft or as Ready. See Plan details and Creating new plans for more details. Plans that have been run are saved by the system as Archived. When you create a new recurring plan and save it as Ready, a master is created on the Recurrence tab of the Plans list view page. Start and stop the appropriate recurring plan. See UI icons for more details about the relevant buttons. Select a recurring plan and open it to edit all future instances. 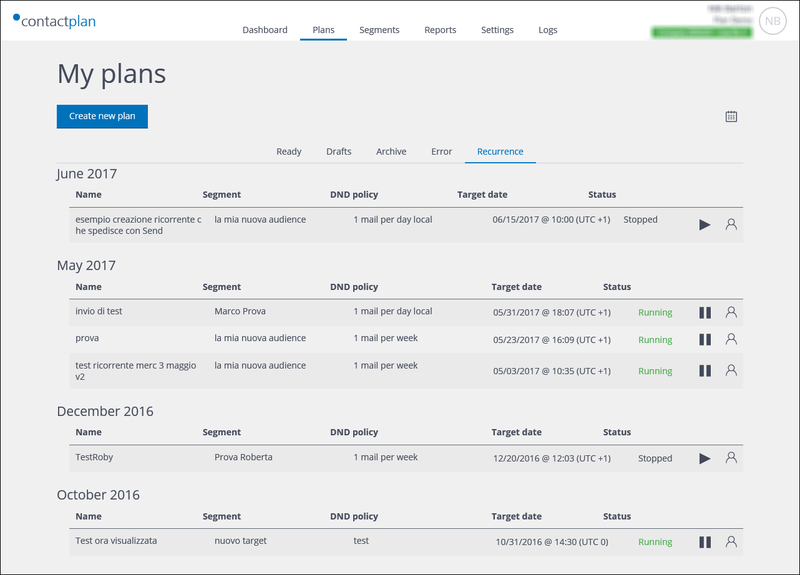 All instances of a ready recurring plan are also displayed individually in the list on the Ready tab, according to when they are to be run. Each instance can be identified by the plan name, followed by a number in parentheses, which represents that particular instance. For example, My new recurring plan (1). However, all instances, except for the next one to be run, are only displayed in the list to help you understand what is planned, and they do not yet truly exist as a plan in the system. As a result, they cannot be opened or edited. The only recurring plan that can be opened and edited from the Ready tab is the next one to be run. Any changes you make are only applied to that instance. See Understanding plans for more about plans. Example of creating a new plan. Creating a new plan directly from a saved segment.